There are many philosophers who believe the world will end in 2012; the Mayans have even formulated a calendar which can (supposedly) foretell the fate of the Earth. It was stated in their writings that the world’s natural rotation would end December 21, 2012, causing massive change including the reversal of earth’s poles as well as a shift in her axes. Others say that a planet named Nibiru will appear between our planet and Mars causing an Earth-ending collision, destroying all life as we know. Even still, others believe that the sun will explode in a supernova; while this is the most likely to happen, it won’t for many millions of years. I am, however, sure that nobody can predict the end of the world. Even scientists who use the most advanced technology in monitoring the activities of the earth as well as other parts of the solar system, can’t predict the apocalyptic end. Below is the list of theories that are currently being developed regarding the apocalyptic end of the world. No one has ever known the exact date and time of the end of the world. Even the Holy books of Christianity and Islam could not claim an accurate date. It was stated in the Book of Revelation (Christian Bible) that there would be a time when the second coming of the ‘Savior’ would be witnessed by all; both living and dead. The people of Earth would see how He, (Christ) will step down from above and save those who believe in Him and His teachings. The Book also claimed that various plagues would occur on Earth and that most people would suffer from hunger and death. One theory states that the end could come from various countries and their development of nuclear weapons. Through preemptive strikes and retaliation, the world could end in a matter of hours. It seems that this end could be the most plausible due to the constant conflict of enemy nations throughout the world. Besides which fact, there is an ever-growing issue of war within nations that could cause civil war thereby escalating into full-on nuclear holocaust. Another theory is that the end of the world will occur in a gradual manner. As man’s mind changes in respect to their religious beliefs of a Supreme Being, humanity will have a shift in consciousness for the basic instinct of ‘human survival’. What exactly this means, no one can say with certainty, but followers of this theory believe that the end of the world will come with a dramatic change in the way that the human mind works and that it will bring about the end of the world in unfortold ways. Nowadays, a lot of seismic disturbances are occurring in many parts of the world. In all probability, it is because of the intense heat beneath the Earth’s crust, mixed with plate techtonics. This theory claims that the increasing heat below the crust is the cause of the seismic occurrences (shift in plates) causing earthquakes. In this theory, earthquakes will be the main reason for the destruction of the world, as it will be swallowed by the heat of the deepest part of the world…the core. Another, more intriguing issue is Global Warming. This phenomenon occurred because of the disregard humans had for the planet earth. Our world is just an object that needs to be nurtured, to be taken care of like a child, to be enjoyed; but because people are greedy for riches and fame, there are many illegal activities that destroy our planet. Logging and mining is the leading cause of deforestation and the destruction of other natural resources. This in turn disrupts the ecosystem and creates floods during typhoon season and droughts during the summer. It is also the main cause of erosion in the Northern hemisphere of the planet. Without restriction, in only a few short years, this total lack of regard for our planet could result in the total annihilation of our planet. This scientific theory about the end of the world relates to the alignment of the planets and the scorching sun. The gravitational force of our planet would change so drastically due to the forces of this phenomenon that some scientists say the destruction would be so complete that no evidence of life on our planet would remain. Scientist claim that this event occurs every 26 thousand years. This folkloric tale about the theorized planet Niburu, states that the entity in question would not actually collide with our own, but instead would pass near Earth and absorb her gravity causing massive destruction, resulting in the collapse of our solar system. This would mean the end of every living organism as we know it. This intriguing theory about the end of the world is focused on the life of the sun. The sun is the nearest star in the solar system and according to this line of though, is about to go Super Nova. The sun’s life is coming to a close, causing its rays to become intense and focused, denoting that it’s light is getting hotter, eventually getting to the point that it will scorch the earth in intense blazes of fire causing an inferno which no life can survive. The happenings of this theory are quite rare; scientist claim that there is a possibility for the shifting of magnetic poles to occur, however, this will not happen for some time. But once the magnetic poles do change from its normal pattern, the temperature of the earth will change drastically and intensified heat will be the cause of the destruction of earth. 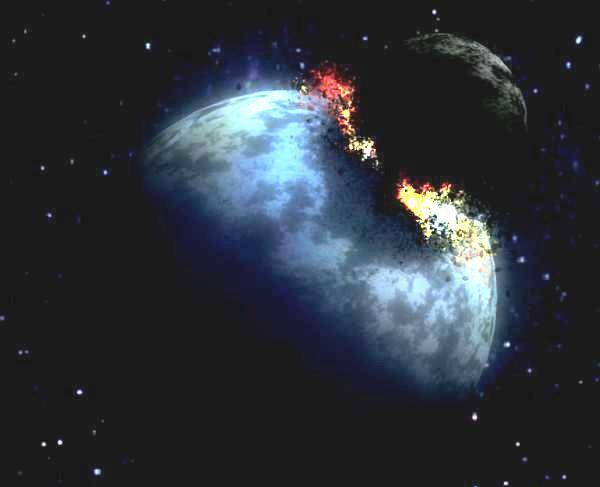 The appearance of this planet in relation to our own was theorized by many people to occur between Earth and Mars, however, it is said that it was destroyed by a huge asteroid and shattered into billions of pieces. Now, it is said that a natural phenomena will occur, which due to the laws of gravity, will cause the shattered pieces of Nibiru to collect back into its natural form. The problem is its axes is disrupted and the chances of having it collide with our planet are now possible. The collision of the two planets would mean complete and utter destruction of both planets and the annihilation of all life present. What an absolute load of rubbish. Tha comedic genius that states the Planet Niburu will “reform” due to gravity is priceless.